According to CoreLogic's most recent National Foreclosure Report, there were 36,000 completed foreclosures in March 2016, a 14.9 percent decrease year-over-year but a 9.3 percent increase since February. March 2016's 3.1 percent seriously deliquent rate is the lowest it's been since November 2007. Only 1.1 percent of homes with a mortgage were are in the foreclosure inventory. The 36,000 completed foreclosures during the month of March 2016 represent a 14.9 percent year-over-year decline and therefore continuing progress over the long-term. However, compared to February, the number of completed foreclosures rose by 9.3 percent on a monthly basis, according to CoreLogic’s most recent National Foreclosure Report. Completed foreclosures have yet to reach their pre-crisis housing market levels, which averaged 21,000 per month across the country between the years of 2000 and 2006, but March 2016’s 3.1 percent seriously deliquent rate is the lowest it’s been since November 2007. Completed foreclosures have yet to reach their pre-crisis housing market levels. This number includes those single-family homeowners on the brink of potential foreclosure, who are 90-days or more past due on their mortgage payment. In addition, the national foreclosure inventory was down 2.2 percent month-over-month (the 53rd month of consecutive declines) and 23.2 percent year-over-year, from 556,000 homes in some state of foreclosure in March 2015 to 427,000 homes a year later. This means that foreclosures comprise just 1.1 percent of all homes with a mortgage, compared to 1.4 percent a year prior. “Nationally, the economy added 609,000 jobs during the first three months of 2016, and average weekly earnings grew 2 percent over the past year,” said CoreLogic’s chief economist Frank Nothaft in the report. “Job and earnings growth have helped bring serious delinquency rates down in nearly every state. 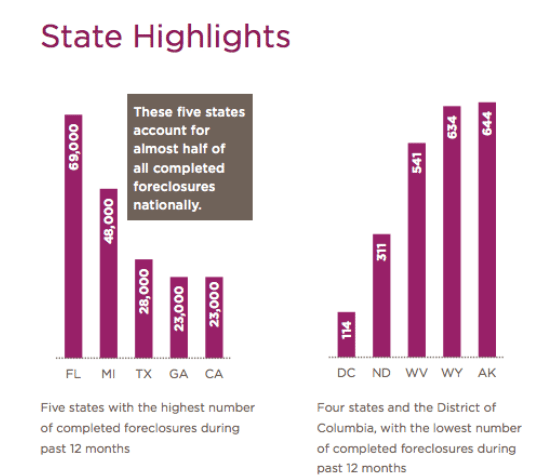 @CoreLogic: Five states accounted for nearly half of completed foreclosures. 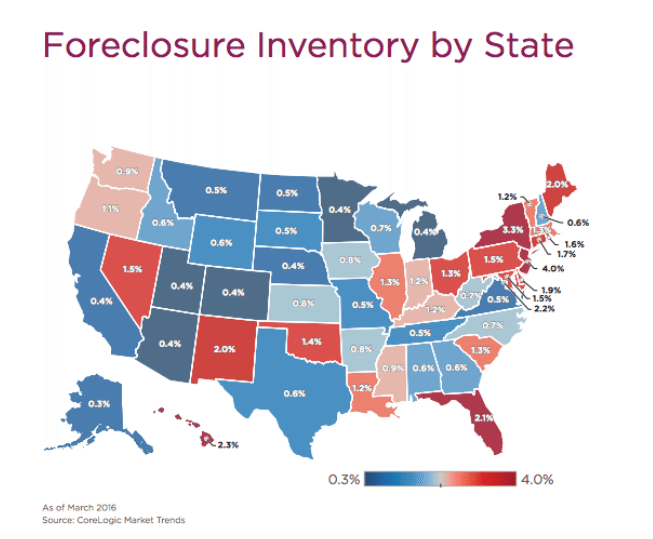 In February, four out of the five states with the highest number of foreclosures were the same with the exception of Georgia, which replaced Ohio in March. “Deliquencies and foreclosure rates are now at pre-crash levels as the benefits of higher home prices, improving economic fundamentals and years of cautious underwriting are being felt across the country,” said Anand Nallathambi, president and CEO of CoreLogic, in the report.